Home Violins WORKED OVER AND OPTIMIZED Italian violin, Raffaele Calace e figlio 1929 - violinist's recommendation! This full-blooded Neapolitanian violin is part of the exclusive oeuvre of stringed instruments from Raffaele Calace’s workshop which has enjoyed an outstanding reputation amongst cognoscenti for nearly 100 years – beginning with no less a luminary than Fritz Kreisler, who was Calace’s clients and only a few years younger than the master, whom Kreisler knew not only as a talented craftsman of musical instruments but also as a musician colleague of equal standing. Raffaele Calace was without a doubt a highly successful liutaio, a term which in Italian always refers to a maker of both plucked and stringed instruments; however, as an globally celebrated virtuoso and composer, he also made the mandolin famous around the world and won numerous international awards, both for his interpretations and for his instruments. The fact that his Naples workshop was able to establish itself as a venue of artistic perfection, maximal productivity and artisanal innovation despite his long concert tours is due in no small part to Calace’s children; his daughter Maria wrote musical history herself as a mandolin virtuoso. 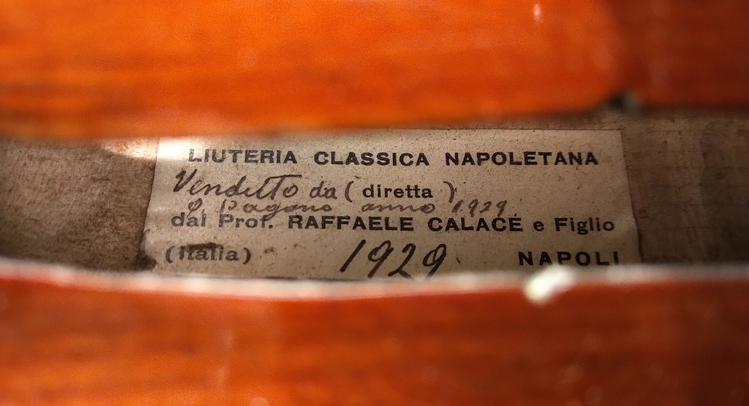 Her brother, Giuseppe Calace, ran their father’s workshop from 1922 onward, which is why this violin crafted in 1929 features an original hand-dated label reading Raffaele Calace & figlio. The instrument mirrors the classic Neapolitan violin model in a clear manifestation of formidable quality which prioritises the inimitably soft and typically Italian sound whilst largely forgoing the spectacular visual accents with which other masters from the cradle of violin making traditionally demonstrated their expertise. The expressive style of the strikingly carved scroll might be considered a figurative signature in and of itself, reflecting the justified self-confidence of an experienced and well-trained artisan. With an elegant spruce top and an attractive deep-flamed maple for the two-piece back, it is clear at a glance that these superb tone woods were selected by a proficient master who understood how to achieve the ideal balance between musical and aesthetic properties. Over time, an interesting patina developed on the attractive reddish-brown varnish, defining the historic aesthetic of this violin that was preserved in marvellous crack-free condition and showing minimal traces of use. It was completely set up with great care at our workshop and made ready to play, and we now recommend this violin with its excellent heritage for performers with sophisticated musical demands. Its gentle voice blends strength and a melting note to create that distinctive character which gives Italian stringed instruments their solid reputation and keeps them in steady demand. Its warm sound and precision in playing both open up a wealth of potential interpretations for solo literature from different periods as well as for chamber music. After another tonal improvement this Calace violin now deserved the recommendation of a member of the 1st violinistof a major Munich professional orchestra.